Wi-Fi goes sideways: While next-door’s Wi-Fi can reach the back of their property, it can also go a similar distance sideways into your house. This extra ‘noise’ can disrupt and slow down your own Wi-Fi. In dense areas, your Wi-Fi is basically getting lost in a swirling field of signals, all using the same channel and frequency. It’s a digital crowd which can seriously slow your speeds. We can fix this by changing your Wi-Fi channel to one with less cross-talk. 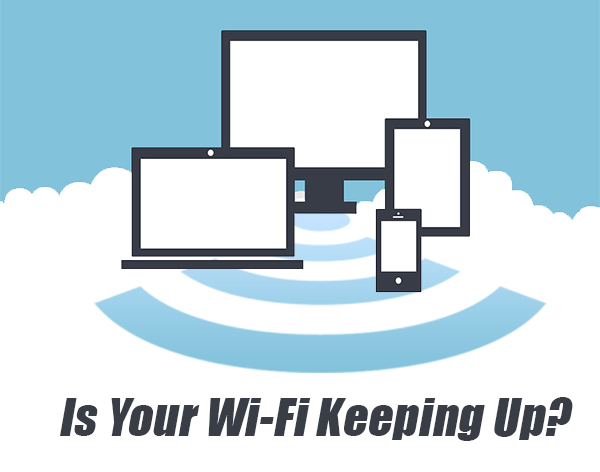 Everyone uses the default settings: Most home Wi-Fi uses a 2.4ghz frequency by default. While it makes a plug & play router easy to set up, it does mean you’re not getting the speeds you could be. Switching to the 5ghz frequency means your Wi-Fi is separated from the neighborhood cross-talk. 5ghz is also considerably faster, which is a bonus. We can help you upgrade to a 5Ghz-capable router or switch your existing frequency. Priority isn’t set: While not Wi-Fi specific, we can also set up “Quality of Service” if your router supports it or supply you with one that does. This allows things like Netflix and Skype calls to always take priority and remain uninterrupted over less important tasks like downloads. You’ll be able to watch movies without those awful buffering jumps and video chat without freezing. Is your home network not keeping up? Give us a call – we can improve your Internet experience.